Since 1996, 21-time GRAMMY award-winner, Shawn “JAY Z” Carter has been a dominant force in popular culture. With multiple businesses and accolades across the recording industry and strong relationships with global investment leaders like Warren Buffet, JAY Z personifies the “American Dream.” Among his achievements, Carter has served as President of Def Jam Recordings, launched the successful “Made In America” festival and acquired luxury spirits brand Armand De Brignac. In 2013, Carter launched Roc Nation Sports, whose roster includes three-time NBA scoring champion and Oklahoma City Thunder star Kevin Durant and MLB All-Star Seattle Mariners second baseman Robinson Cano. Most recently, Carter purchased in the global streaming service, TIDAL, in 2015. Budweiser, an American-style lager, was introduced in 1876 when company founder Adolphus Busch set out to create the United States’ first truly national beer brand – brewed to be universally popular and transcend regional tastes. Each batch of Budweiser follows the same family recipe used by five generations of Busch family brewmasters. Budweiser is a medium-bodied, flavorful, crisp and pure beer with blended layers of premium American and European hop aromas, brewed for the perfect balance of flavor and refreshment. Budweiser is made using time-honored methods including “kraeusening” for natural carbonation and Beechwood aging, which results in unparalleled balance and character. The brand celebrates great times and has used the phrase “Grab Some Buds” in advertising since 2010. 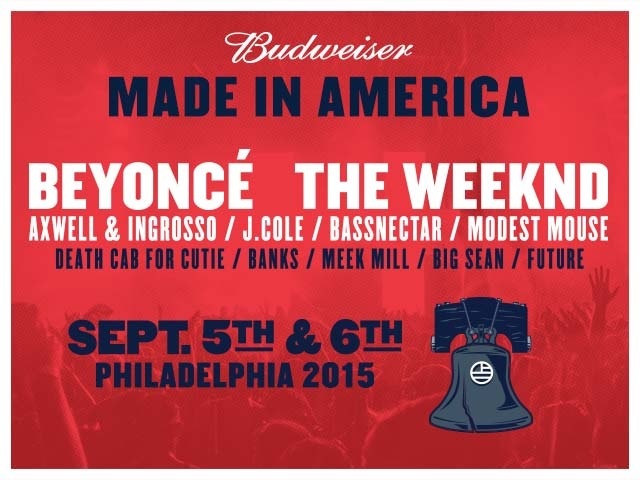 Slated for its fourth year in Philadelphia, the “Budweiser Made in America” Festival will once again attract thousands of visitors and festival-goers to the City of Brotherly Love on Labor Day weekend 2014. After the inaugural two-day music festival in 2012, Mayor Michael A. Nutter announced that the event generated at least $10 million in economic impact for the city’s economy. Additionally, the “Budweiser Made in America” Festival benefits local United Way organizations with the goal of having a positive impact on the host community. As a result of the 2012 festival, United Way of Greater Philadelphia and Southern New Jersey invested more than $350,000 into education and workforce development initiatives. The City of Philadelphia is well-positioned to host the festival once again in 2014: the city is strategically located on the east coast, boasts world-class transportation and amenities, and local officials have experience producing and accommodating big events like the annual Gore-Tex Philadelphia Marathon, the annual Wawa Welcome America Festival for the 4th of July, and the upcoming World Meeting of Families 2015.